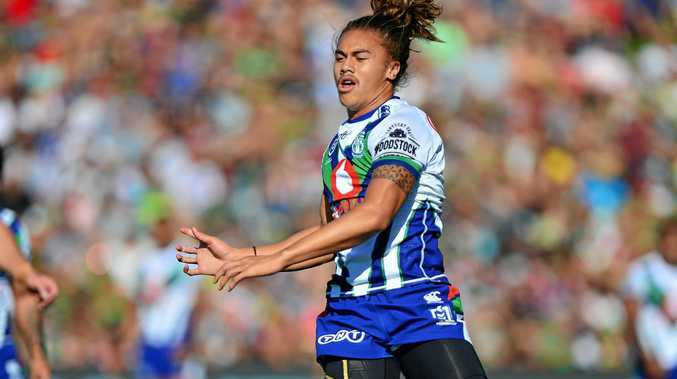 RUGBY LEAGUE: Warriors coach Stephen Kearney says two-gamer Chanel Harris-Tavita is showing some good signs early in his NRL career, after he shouldered much of the burden in their slim loss to the Rabbitohs. The 20-year-old was pitched into the deep end after halves partner Blake Green suffered a groin injury just before their match at Sunshine Coast Stadium on Saturday. The late withdrawal of the 143-game stalwart was a significant blow to New Zealand. "It's not ideal. He's your chief ball player,” Kearney said. Five-eighth Harris-Tavita picked up most of the slack when it came to ball playing. He passed on 44 occasions, which was twice as much as last week. "He did pretty good. He had Sam (Burgess) running at him all day and for the most part he managed pretty well,” Kearney said. Harris also kicked eight times, made 17 tackles and booted four conversions in the 28-24 round five loss. Harris-Tavita also had an attempt at a field goal from about 35m out, while under pressure, when the scores were locked at 24 apiece. "I'm not 100 per cent sure if that was the right play at the time but he took it upon himself to go after it and I'm always going to back him for that,” Kearney said. Kearney said he was unsure of the seriousness of Green's injury.